He was born in the township of East Haddam, in the State of Connecticut, on the 5th day of September, 1797, at the family mansion, where his ancestors had lived for more than one hundred and fifty years. He died the proprietor of his paternal acres, bequeathing them to one of his sons. His father was a soldier in the war of Independence, and participated in several of the sanguinary conflicts of that great struggle. He received his education at Yale College, and graduated with honor in the class of 1818...In 1824 he removed to Greensboro, and there commenced the practice of the law. Unknown and unassisted he came in competition with the talented Bar of that town, then composed of some of Georgia's most gifted sons, among whom stood conspicuous,...William C. Dawson...In January, 1829, he married Miss Jane Cook, orphan of George Cook, of Jefferson county, and ward of the late Judge Dawson, under whose hospitable roof the marriage took place. This happy union was severed by the untimely death of Mrs. Cone, who died in 1840, leaving two sons and a daughter, all of whom still survive. ...For three months, he was confined to his bed of death, yet no murmur or word of complaint escaped him...Calm and resigned to the will of Heaven, he awaited his last summons, and died confidently trusting in the wisdom and mercy of his Creator. The second article is a favorite because it describes the physical characteristics of Judge Cone. It's from the 14 June 1867 edition of Georgia's Macon Weekly Telegraph, page 1, entitled "Sketches of Georgia Lawyers: Number Five: Francis H. Cone". Before I move to the last article, followers of historical Southern politics might also remember (or like to know) that Judge Cone is sometimes most remembered for something not even whispered about in these articles -- stabbing future Confederate Vice President Alexander Stephens six times in front of an Atlanta hotel in 1848. Lucian Lamar Knight told of the incident in his 1914 publication, and I've shared it here at the Peachy Past blog. 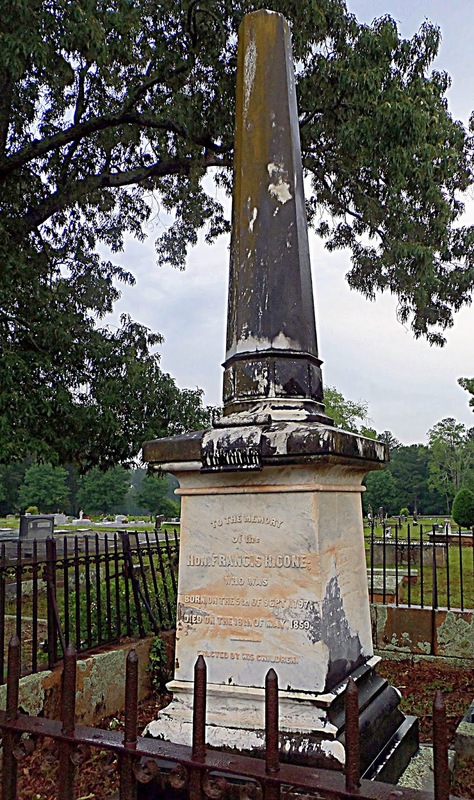 The final article mentions the epitaph and monument placed for Judge Cone. It is from the 17 June 1912 edition of Georgia's Augusta Chronicle, page 4, entitled "Judge Francis H. Cone: Reminiscences". He was a man of most unique personality and a man of infinite jest. There are more laughable anecdotes told of him than almost any other man in Middle Georgia. He was a great friend of United States Senator Josh Hill of Madison, although these two were totally unlike in manner, disposition and temperament.